The current telecommunications environment is characterized by rapid technological advancements, development of new applications and new transaction methods. These factors influence and rapidly affect the business models of modern companies. Telecommunication networks and applications shift from being secondary support mechanisms into strategic business tools. Many companies are found amidst this technological storm, without the necessary resources, which would allow them to upgrade the role of their networks and applications, in order to gain a competitive advantage. OTEGlobe responds in its own customer oriented way, in order to support their smooth transition and introduction into the new, changing world of the networked, globalized economy. The company – on behalf of the OTE Group – has designed, deployed and fully manages one of the most advanced networks strongly characterized by high security, safety, uninterrupted operation and end-to-end central monitoring. Through its network OTEGlobe offers a full portfolio of IP/Data, high-capacity connectivity & bandwidth solutions as well as integrated services for voice, data & video. Aiming to provide telecommunications services of the highest performance, OTEGlobe implements and fully manages an international Multi Service Platform (MSP) using state of the art Cisco equipment. OTEGlobe’s international network uses the most advanced technologies, such as ATM and MPLS. The OTEGlobe network Featuring High Capacities with nodes interconnected via multiple SDH links, Carefull network Design and Resource Management, it demonstrates high quality and minimum delay. Additionally, being extensively redundant, and able to re-route around failures, it guarantees the maximum availability for OTEGlobe customers. Through this network OTEGlobe provides Service Providers as well as Enterprises a high capacity, multi service, secure infrastructure that guarantees uninterrupted operation, end-to-end central monitoring, twenty-four hours a day, seven days a week. 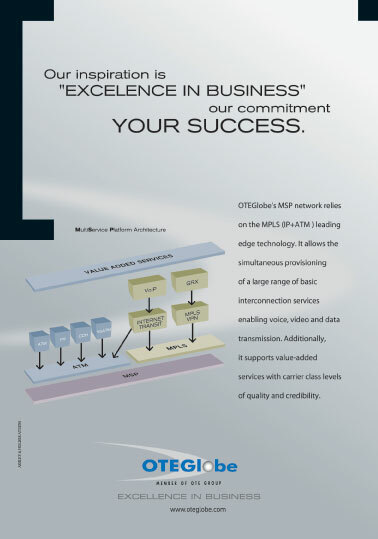 OTEGlobe’s Multi Service Platform is a fully managed network. It comprises of two levels of hierarchy: the core level with three (3) nodes and the access level with the rest of nodes. The core nodes are placed in Athens, London and New York and are interconnected via multiple STM-1 links. The access nodes are placed all over the world and are connected via multiple SDH links to the nearest core node. One of OTEGlobe’s main activities are also the wholesale provisioning of international voice traffic, capacities, as well as, value added services and integrated solutions. OTEGlobe’s network reliability, stability and consistency ensure autonomous presence at the most important traffic exchange points. Through its strategic alliances with Tier-1 carriers as well as its peering agreements, OTEGlobe offers, all over the world, voice traffic of the highest quality and the lowest prices, elevating its market share at a steady pace. Additionally, OTEGlobe’s hubbing center realizes voice traffic termination, through OTE’s network, to third countries. The single point of contact for all OTEGlobe services, the flexible interconnect billing as well as the International Traffic Management System (ITMS) are fundamental factors that ensure the excellent cooperation with OTEGlobe. During 2003, due to important agreements (approximately 1000) made with major mobile operators and foreign carriers, OTEGlobe increased its outgoing voice traffic and stabilized its incoming voice traffic, despite the strong competition. OTEGlobe, through the synergy of technical experience and managerial skills of its professionals as well as their strong commitment to quality and customer satisfaction, has increased the outgoing voice traffic from mobile operators by 24% and from alternative operators by 1600%. Self-healing double SDH rings interconnecting OTEGlobe nodes. OTEGlobe has planned the network footprint with customers’ needs continuously in mind. During the present state of the network deployment the OTEGlobe services are offered in the following locations: Albania (Tirana), Belgium (Brussels), Bulgaria (Sofia), Cyprus (Nicosia), F.Y.R.O.M (Skopje), France (Paris), Germany (Frankfurt), Greece (Athens, Thessalonica), Netherlands (Amsterdam), Italy (Milan), Romania (Bucharest), United Kingdom (London) and USA (New York) while Pakistan (Karachi) PoP is at the implementation phase. In addition to enhancing, enriching and offering value added features to OTEGlobe services, a very important issue in the services evolution is the geographical expansion strategy. Thus, OTEGlobe is committed to grow and to aggressively expand in order to obtain both global reach and national depth by strategically installing new nodes and by peering with Carriers/Partners/Local Loop Providers. In the phases that follow the present deployment of MSP, the network footprint is going to sites that are of our customers’ interest. The PoPs planned include Russia and Turkey. With its presence at strategic locations worldwide, the MSP fully meets the network needs of OTEGlobe and its customers, both Carriers & Multinationals. Through the MSP, the Group ensures for the first time its autonomous presence at the most important traffic exchange points: London, Frankfurt, Paris as well as the Amsterdam (“the golden rectangle”) & New York for Carrier traffic exchange. Through the provisioning of the services CES & Voice Trunking, which facilitate an improved cost structure for the delivery of international transit capacities, the international data/IP network is transformed from a pure data network into an international network infrastructure.